This is the brand new page for 2018's Continuation of our UFO Challenge of the Month. The rules are simple: Support and encourage on another to complete our accumulated UFO's. You can set a goal for each month, but it's definitely not required. A "finish" is defined as removing a UFO from your stack of incomplete projects. The way you accomplish this is up to you. You can finish the project, pass it on to someone else to finish, donate it, sell it. You see we are very flexible. Our goal is to reduce the pile of UFO's. And yes, you can move your UFO to someone's pile. It's been done before. We are great enablers, too. All are welcome to hop on this UFO train; we reach out our hands to help you get on the train. The train will blow its whistle for each new member and we ring the bell for all the finishes that happen!! It doesn't matter how you count your UFO's; it's entirely up to you. No UFO Police allowed here!!! We all love pictures so feel free to share whenever another UFO becomes a Finish project! I'm looking forward to this UFO Challenge. 2017 was a great success. Congratulations to everyone who participated last year. I hope you will join again this year and turn a few more UFO's into complete works. The train will be leaving the station. All aboard. I'm in have a qayg sampler quilt which I'd hoped to finish last year but didn't get done. A Christmas wall hanging which was started two christmases ago and just needs embellishments. Then a Christmas quilt which had been started and passed on to me over a year ago. Thank you for taking over from Janice, although not very active on thread follow it and keeps me focused. I'm in. My list of UFOs is up to 13 now and I have not discovered all of them yet. This new thread needs a picture. So here is the last one I finished in 2017. Sunrise.....I think I did post this on last years thread. Mind is slipping. I only take them to the floppy state right now. I have a long arm, but that is really backed up right now. I’m going to really work at participating this year— need to pull them out, look them over & make some headway. This will be motivating. I managed a few finishes last year, but think I created as many as a finished I need to avoid that this year. I’m in. Thanks for stepping up Happylab! I’ve got at least 20 UFOs, some are traditional quilts, others are art quilts. Not sure how many I can commit to for the year, so I’ll shoot for 1 per month. And I’m sure I will be adding some to my UFO pile since starting new things, getting them to a “what now?” state and setting aside until inspiration strikes (or perhaps just desperation to reduce the pile) seems to be a major part of my creative process . I need to join also. I tried to finish 2 UFO's last year to start one new one. I did pretty good for a while. I have 6 quilts that are now quilted but just need binding. They don't have homes so I am having a hard time finishing them. I alos have a bunch of UFO's, I am afraid to count them. I'm in again this year - from the start this time I counted my UFOs last week, and have at least 41 (at least, because I'm pretty sure there are a few hiding that I've forgotten about, plus there are 8 "active" projects right now that could easily become UFOs before the end of the year. In fact, on reflection, one already has. Hoping for some good progress this year, or at least 1 for every month to help keep the count moving. Happy New Years Day everyone!!! Thank-you everyone who has already jump on our UFO train, Toot toot Cannyquilter, BattleAxe, ckcoul, rryder, meanmom and Kristakz. Anyone can jump on at any time. I'm looking forward to a fun, pic of works in progress and pics of wonderful UFO's completed this year. (I think all finished projects are wonderful). Thank-you BattleeAxe for giving us a pic for our thread for encouragement. It is a wonderful quilt. I like the modern design. Congrats on your finish to end up last year. I have too many projects to want to count, but I do plan to complete some this year. My goals this year is to complete from 8-12 bed size quilts and 12 small size projects for the year. Currently I'm working on redoing BHMQ 2017. I'm exchanging out the yellow blocks with 1/2 square triangles background/purple blocks. When it's done it will go out for quilting. I'm also going to finish a few items I did not get to last year; sew purple binding on a purple tree skirt, charity quilt, to name a few items. On board here for a year's worth getting them done! Started a finish yesterday...just a little one, but a start for sure. I'm afraid to make a list...would scare me from even thinking of starting to finish..now that sounds like an oxymoron! I'm in again for this year. I've finished most of the easy UFOs so this year will be working on some that are in the early stages -- fabric pulled, and at least some cut and assembled. I haven't counted them, but I think I have about a dozen to finish. Happy New Year's to all. Please include me again this year. I only completed 9 last year among my very lengthy list and have not posted the last 4 as I am having problems with the picture loading. Hope 2018 will be better. Take will keep me busy this year. Thanks for organizing this and wish everyone good luck completing their UFO's. Okay, I'm boarding this train again. I think I only managed one UFO finish last year ...... <sigh> but this year will be better ....... happylab thanks for stepping up and taking over this train. I'm in too. I refuse to count how many I have. What I have left are big projects that will take me some time to do, so I won't state how many I plan to get done. If I only get 2 done I'll be pleased!. 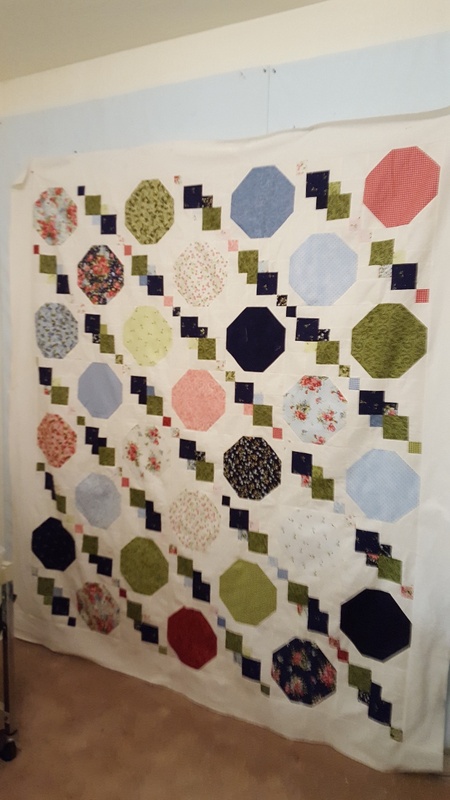 Talking about "overdue", I plan to dig out and continue a "wedding" quilt that has been under construction for about a decade. Three of four seasons are done and goal is to finish SPRING by the end of spring, 2018, and have it quilted by the end of summer. Wish me good concentration, please! Will need to count up UFO and list my number. I’m in! I had 2 last year to start the year and I still have those 2. Ooops! I also have orphan blocks that I count as an UFO when I make a mainly orphan block quilt top. I probably have more UFO’s lurking in unknown spots. I am giving myself until the end of the month to finish up last year’s Bonnie Hunter Mystery quilt before I add it to my UFO list. I also have some tops that I want to FMQ or use embroidery stitches to quilt them but they aren’t at the year mark for a while yet. Speaking of happy, many thanks to HappyLab for taking over the UFO Challenge for this year!! I have 13 UFO's (without really digging into the closet!) that I want to either completely finish, or at least make a dent in. I have one ready to load on the frame now... so hopefully, that will be my January finish. Why is the thread named a challenge of the month, if the challenge is a goal for the whole year? Can't wait to get to some sewing this year. Count me in. I started 2017 with 22 UFOs and finished 2017 with 23 (started 3 more, finished 3 and made orphan blocks into a flimsy). Ugh!!! Yes, I need to keep riding the train with y'all. I know that I have over 40 UFO's, but I'm not about to pull them all out and count them, lol. However, now that I am starting to do simple fmq, I am hoping to get more than a few of them finished up. This month, my goal is to finish up a scrappy Irish Chain I am working on, which is about a third of the way assembled. I need to get on the train! UFO challenges make me feel guilty, but I do have piles of blocks that have never been made into tops. One is Allietare, the mystery quilt from two years ago. And I have about 80 Farmer's Wife 1930's blocks, some civil war blocks, some Pony Club blocks, and a couple of Boom quilt swaps to be put together. Then there are my unquilted tops... lots to do. Hopefully I'll have some things to post this year. Welcome happylab as our new conductor for this UFO train. Happy New Year to all once again. Yes, yes, yes I am on this train again. I still have the three original quilts that started last year with. Last edited by cherrybsixty; 01-01-2018 at 08:35 PM. I'm on board! My 2017 goal was to finish everything I started! Today I finished a knitted blanket for my baby grandson. I started it last June. One day late but Done. My other 2017 UFO is a lasagna quilt I made for my son for Christmas. Unfortunately it's still just a sandwich. That will be my first official 2018 quilt UFO to complete. Other than these two 2017's my UFO list will more than keep me busy in 2018! "Be not afraid, only believe."